The Stowboard was not created with tricks in mind. (Though they are possible. See the amazing “Tricks with Stowboard” video!) However, when the objective is to roll smoothly from point A to point B the Stowboard is the fastest and the smoothest. the Stowboard offers a vastly more comfortable ride, smoother, faster ride than a new school deck. Your typical new school deck utilizes extremely small and hard wheels which may be good for tricks, but are extremely loud and uncomfortable on imperfect surfaces. In contrast the larger 110mm front wheels and softer rear wheels (65mm conical, 78 durometer) quietly and smoothly pass over minor debris and cracks in the pavement. Not to mention, only the Stowboard has the ability to fold up small enough to fit in a backpack or locker. Even though a new school skateboard isn’t as bulky as a longboard, it’s obviously not as compact as a stowed Stowboard. The Stowboard when folded is about the size of a standard dictionary and can be stowed in any conceivable location: under your seat, in your backpack, in a small locker, chained to a bike rack, anywhere. Additionally, it is a fact that some people in society place a negative stigma on Skateboarders often associating them with punk culture, grafitti and anarchy. Whether this association is justified or not, Stowboard riders do not face such discrimination. The Stowboard can even be rode in airport terminals. (Try getting away with that on your new school deck!) With it’s clean ultra modern styling the Stowboard seems fitting for any look: a busy executive, a traveling artist, someone walking their dog, a student, a yachtsman at port, men, women, children, it doesn’t matter. the Stowboard is for everyone. Longboards have a high center of gravity and are much bulkier and more cumbersome than the Stowboard. Like longboards the Stowboard provides a fast, smooth ride BUT with a much lower center of gravity. When riding a Stowboard you are standing just an inch and a half off the ground. On a longboard you are at least 5” off the ground! The lower center of gravity of the Stowboard permits finer control, greater acceleration and enhanced response and reactivity over any longboard. Additionally the Stowboard offers the ability to fold up and stow away, whereas longboards remain extremely large and cumbersome. Longboards range in length anywhere from 31” or to over 5 feet long! Compare this to the 11” by 8.5” by 4” block the Stowboard folds into. When traveling using mixed transportation; such as airplanes, trains, or buses; the Stowboard provides a FAR more practical option than a longboard as it can fold up to fit easily in your luggage or under your seat as you travel. When traveling to work or campus only the Stowboard folds small enough to legitimately be able to stow anywhere. A folding bike travels with you ... but does it really travel well? Even the lightest models weigh 24-30 pounds, and they are often still three feet in length when folded up! Try stowing that in your back pack! They are expensive too. According to Pertrans.com, decent quality folding bikes ("excluding cheap bikes that won't last") cost $500-$1,050. The Stowbard folds up small (11") and light (6 lbs, 11 oz) for True easy travel. Because of its small size, the foldable scooter known as the Razor is most popular amongst small children. The handle bars of this foot powered scooter require you to hold on, whereas the Stowboard allows the rider to keep his hands free. Without having to worry about handle bars, the Stowboard can be used by any person regardless of height. And even the smallest models are twice as long as the Stowboard when folded. The ripstick is a novelty device that allows the rider to propel himself, without putting a foot down. The rider is able to slighlty propel himself forward by swiveling his hips back and forth while shifting pressure to different parts of the feet. While certainly fun and challenging, the Ripstick (or Waveboard, as it is sometimes known) is really not a legitimate transportation solution. When running late for class or sprinting to catch the bus nobody would hop on their ripstick and wiggle their way to their destination. It just doesn’t cover distance efficiently enough to be a reasonable point A to point B type option. While fun and expressive, the ride provided by the Ripstick is not primarily designed for legitimate transportation. Walking has been the standard mode of transportation for roughly the last 2.5 million years since man became primarily bipedal. It has served us well allowing us to reach slightly higher hanging fruit, and in the process freed our forelimbs to evolve increased dexterity including opposable thumbs. With bipedal locomotion, some exceptional humans have been able to achieve maximum speeds of just under 10 seconds for 100 meters. However, walking at typical speeds is substantially slower and the time savings accumulated over a year could be massive. If a person saves an average of 30 minutes a day Stowboarding instead of walking That would add up to roughly 8 Calendar days per year! That’s over a weeks vacation per year just by Stowboarding! The Camel is an even-toed ungulate within the genus Camelus, bearing distinctive fat deposits known as humps on its back. There are two species of camels: the dromedary or Arabian camel has a single hump, and the Bactrian camel has two humps. They are native to the dry desert areas of West, Central and East Asia, respectively. Both species are domesticated to provide milk and meat, and as beasts of burden. Preferable for desert conditions, however unwieldy in urban environments. While an intelligent and hearty animal, the Camel is simply order of magnitudes more cumbersome, more expensive and more maintenance intensive than the Stowboard. -Still large and cumbersome even when folded! Stowboard: Simply the Smartest Way From A to B. 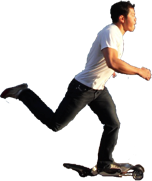 The Stowboard provides a brilliant, one of a kind, fast, smooth, stable ride. It gives you a much lower center of gravity which translates to enhanced control AND larger diameter lower resistance front wheels for a smoother ride than any other board out there. Even if it didn’t fold up, its ride qualities would stand on its own and remain unparalleled. Add to this the added ability to fold away to the size of a dictionary for take ANYWHERE convenience, AND throw in a price equal to or lower than any longboard and the Stowboard emerges as the clear CHOICE for personal transport for students, professionals, dudes, chicks, tech enthusiasts, futurists, dog walkers, travelers, and anyone else out there who appreciates good design. Just for fun we compare the Stowboard to other personal transport options. -Slowest form of transportation there is besides ripstick.